I’ve been a big fan of reading Kindle ebooks for a while now, but so far I have done all my reading on my iPhone. I bought a couple of the earlier Kindle eReaders but never liked them: the page turning, the form factor, something about them just wasn’t as good as reading on my phone so I didn’t use them much. Last week though, Amazon were doing a deal where the latest Kindle was 5,000 yen off, so I picked one up for under 4,000 yen. And loved it. It’s light, the screen looks great, and the pages turn in a pleasing manner. It’s a bit too easy to touch it by accident, but not a deal-breaker. So far, so good. It’s a nice device, and the prices are coming down so fast that these things are practically disposable now. And that’s what hit me. On Thursday as I was showing some teachers around the Academy, it struck me that Kindle could be the answer to our high-level book problem. You can sync multiple devices to the same account (my account is linked to a dozen: computers, smartphones, tablets, and all those old Kindles). I already have close to 1,000 books on there (although 90% of them are fantasy, science fiction, personal finance, productivity, or teaching) and it would be easy to pick more up as needed. The school would appear funky, students would probably appreciate the novelty, and we wouldn’t need anywhere near as much space for marginal books. What do you think? Genius or what? And my account is valuable enough for me not to want that to happen now. Oh, well. It’s a shame that ebooks cost as much as paperbacks (sometimes more) but are way less flexible (you can’t sell them or give them away, and lending them is very limited). I wonder if there is a commercial account for Kindle? Technically it’s probably doable, but I’m currently working on a digital library project and all I will say is you will want to check the End User Licence Agreement for the Kindle as they will have definitely already thought of that. Nice try Ben. I have a Kindle Voyage and it’s great. 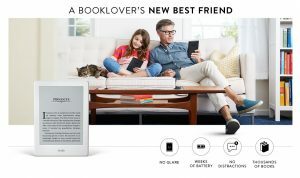 Paper books are still better – see the below link for a study which shows people retain information better from reading paper – but seeing as I save shelf space, and live in Taiwan where it can be tough to get everything I want, the Kindle is excellent. Shame that I can’t pass on ownership of e-books though. I agree with that. I love reading low-brow fiction and popular non-fiction on Kindle, but anything more technical or difficult I find easier to read on paper. Not that I read many difficult books nowadays! You can lend ebooks now for a couple of weeks, which is a start. It wouldn’t work for copyrighted books. But if you could find/adapt suitable material from places like Gutenberg. Or make your own. That’d be the ticket. Too bad you can’t just put them all on cloud storage and allow access to your students through invitation. They have all those free e-books from Oxford, but I tried with a student’s tablet in a class once, and page-turning was so slow that it really killed the shared reading experience. Was it her tablet, the wi-fi provider, or the site? I don’t know, but was definitely NOT a fan.